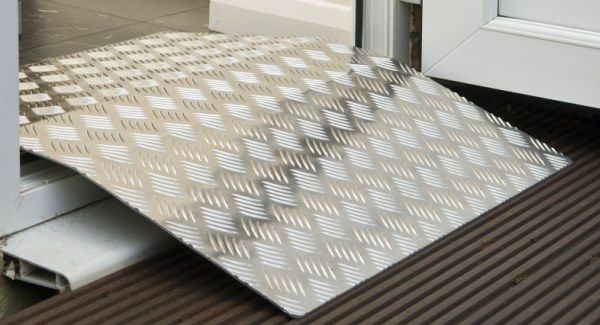 This wheelchair bridging ramp is the answer to issues posed by thresholds and doors by offering a smooth ramp over the lip of the threshold. This exceptionally aesthetically pleasing threshold ramp is made of anodised aluminium that prevents corrosion and staining. It is extremely lightweight with an excellent grip surface in any conditions. The rubber strips on the underside of the bridging ramp offer protection to the floor surface whilst preventing slippage. Ease of set up and transportation is aided by carrying holes. In all, this is a very well designed product. I was very impressed by the speed in which the ramp was delivered. the part was delivered quickly and does what it says, due to my door only opening 90 degrees i have had to trim one edge by 35mm, to allow it not to clash with the door. This ramp is exactly what we were looking for to enable access into a garden area over a door step that could not be addressed with a permanent ramp. Light enough to be moved by an individual and easy to store. The ramp arrived very quickly and looks like it will do the job. Fairly lightweight and well constructed. Very happy with product.